Face wash is for everyone, eye cream is akin to a 200-level course, but keep a jar of Vitamin A-D-E Neck Cream on hand and you are earning a master’s in good skin. Here are 5 reasons this neck cream is worth the extra step. Oh, what a lovely neck you have! 1. It contains antioxidants. These are substances that help protect skin by blocking or repairing the damage due to factors that include exposure to the sun’s rays, pollution, and chronological aging. 2. It provides moisture. Hydrated skin looks healthy, vibrant, and yes, youthful. It seems so simple but you might be surprised at what a big difference keeping your skin properly hydrated makes. 3. It contains Hyaluronic Acid. Do you have a tendency to seek out products that contain certain ingredients? I do. When I see hyaluronic acid on a moisturizer or eye cream label, I’m all in. Without getting too scientific, you can think of this ingredient as a magnet for moisture. By binding moisture to the skin, hyaluronic acid is credited with having the ability increase skin’s moisture levels and reduce the appearance of fine lines. 4. It is part of one of my favorite skin “recipes.” When it comes to skin care 1+1 doesn’t always equal 2. When you pair the right products 1+1= magic! Such is the case when you with Mario Badescu Cellufirm Drops and Vitamin A-D-E Neck Cream. 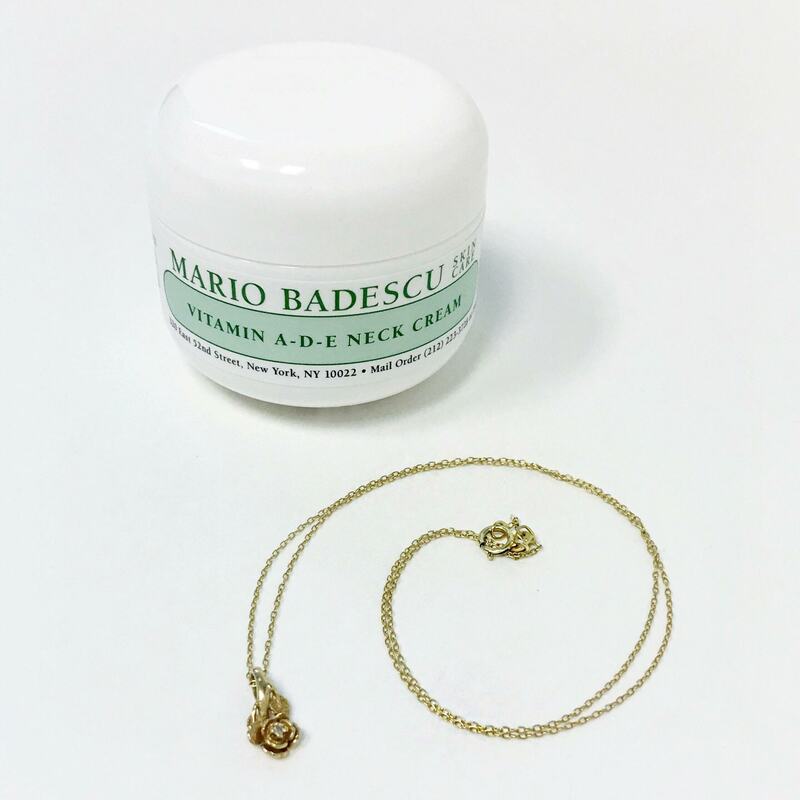 First apply a thin layer of Cellufirm Drops to the neck and décolletage, follow with Vitamin A-D-E Neck Cream. I love how my skin looks after using this combo regularly for a week or so. 5. When I have a jar handy I take better care of my skin overall. Someone once told me that you should pay just as much attention to any skin on your body that is exposed to the sun as you do to your face. This advice makes perfect sense. Not taking care of anything but our face is why our neck, chest, and hands are usually what gives our age away. Having a jar of Vitamin A-D-E Neck Cream on my bathroom counter reminds me to extend my face care regimen to the exposed skin below my chin. It sets off the inertia that leads me to use my cleanser, toner, and serum on my neck and décolletage also. Over time I’ve noticed a visible effect on the look and feel of my skin.